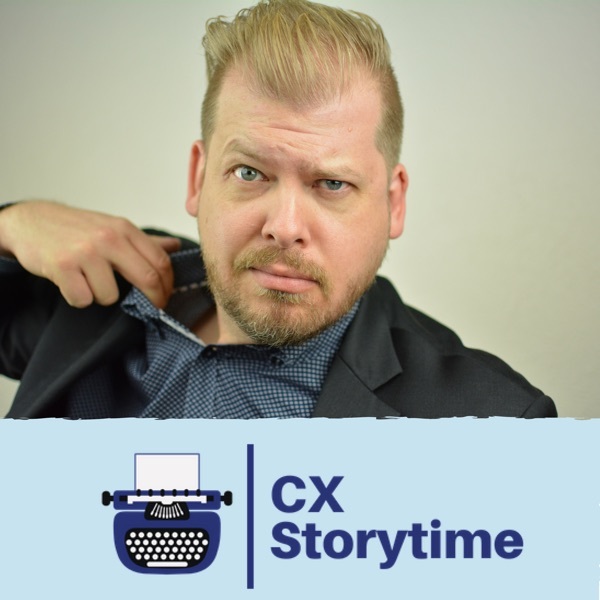 CX Storytime, Tales from the Customer Journey | Listen Free on Castbox. Stories of your customers on their journey, and how they build or break relationships with companies like yours. Host Russel Lolacher shares real customer experience case studies in a 1950s radio drama narration style with modern tips and analysis. Born from The Upsell.com Blog, The CX Storytime Podcast: Tales from the Customer Journey presents true customers' stories including the impacts of their customer experiences, followed by valuable strategies on engagement and retention to help you get ahead in building your online business or enhancing your brick and mortar store. Discover how the customer service experience is an emotional experience for your new, current and future customers and the steps you can take or the ideas you can think about to establish trust and long-term relationships by better serving your customers and your bottom line. Russel is a customer communications advocate and believes whether you are serving in store, over the counter, on Twitter, Facebook, Instagram, and social media, through podcasting, books and ebooks, online courses or any other point in a customer journey, communicating and connect with humanity is key. Customer Experience Storytime host and storyteller Russel Lolacher shares the story of When Stress Meets Service. In this tale, we’ll hear the story of Louis, who in a fit of stress and procrastination, forgot to solve a problem that would cost him more money than he was comfortable spending. We’ll hear about how his service provider chose to address Louis and his problem wrapped in a bundle of frayed nerves. We’ll wrap it up by digging into the emotional impacts, the lessons you can take from this story to help your business and the universal truth to live by. Customer Experience Storytime host and storyteller Russel Lolacher shares the story of Two Ears, One Mouth, Zero Service. In this tale, we’ll hear the story of Colin and Renee. A couple doing what many couples do, go out to eat. This time however, it left them feeling like their needs didn’t matter and with a bad first impression of a new city. Then we will explore what were the emotional impacts from those actions and the actions or strategies you can take to move your customer relationships forward. Customer Experience Storytime host and storyteller Russel Lolacher shares the story of A Service Tier Too Far. In this tale, we’ll hear the story of Sarah. A woman trying to advance her event-driven side hustle with an online ticketing and management system, only to learn their service is not geared towards helping the customer and their ticket holders. Listen to hear how one customer experience could drive someone away to competitors, by making it more difficult than it needed to be, then we will explore what were the emotional impacts from those actions and the actions or strategies you can take to move your customer relationships forward. Customer Experience Storytime host and storyteller Russel Lolacher shares the story of The High Price of Canopy Coverage. In this tale, we’ll hear the story of Jack and his search for a canopy for his pickup truck, his experience with various dealers and how one business responded when the prices differed widely, then we will explore what were the emotional impacts from those actions and the actions or strategies you can take to move your customer relationships forward. Customer Experience Storytime host and storyteller Russel Lolacher shares the story of The Couch with Abandonment Issues. In this tale, Today…we’ll hear the story of Todd, who was planning with his wife Vanessa and their children to move into a new beautiful home. Following delivery information he found on a wholesaler’s website, he was planning to enjoy a new furniture set with his new house. The wholesaler and the delivery service hand other plans, including abandonment and avoidance, then we will explore what were the emotional impacts from those actions and the actions or strategies you can take to move your customer relationships forward. Customer Experience Storytime host and storyteller Russel Lolacher shares the story of The Crooked Path to a Tattoo. In this tale, Jeremy is enjoying a beautiful, exotic vacation with his girlfriend Bree. To mark the occasion, he decides to get a tattoo only for that experience to take more turns than anyone expected. Listen to hear how one customer experience could end an epic vacation on a low note and the small business that wouldn't let that happen, then we will explore what were the emotional impacts from those actions and the actions or strategies you can take to move your customer relationships forward. Customer Experience Storytime host and storyteller Russel Lolacher shares the story of Have Wine, Might Travel. In this tale, Paul and Clarissa travel to wine country to relax and enjoy some downtime. They want to visit the local wineries but know how stressful it is trying to get more than a few bottles back home. What's an airline's role in the tourist's customer experience? Listen to the couple's story to learn how Pacific Coastal Airlines sees their involvement in the couple's experience, then we will explore what were the emotional impacts from those actions and the actions or strategies you can take to move your customer relationships forward. Customer Experience Storytime host and storyteller Russel Lolacher shares the story of The Jilted Jewelry Store. In this tale, Joan really wanted a necklace she'd seen in the window of a local jewelry store boutique, only to encounter a business who wasn’t as excited to see her. Listen to her story to learn how the assumptions of a staff member can not only lose a sale, but also the future business of a customer, then we will explore what were the emotional impacts from those actions and the actions or strategies you can take to move your customer relationships forward. Customer Experience Storytime host and storyteller Russel Lolacher shares the story of The Man Who Should Not Move. In this tale, David wanted to try out the craft beer of a local brew pub when he was struck by the intolerance of others and the shocking response of a brewpub manager. The tale starts from the pub floor and travels to a social media forum where it becomes a spectator sport. Listen to his story to learn how the actions of a restaurant manager can represent the entire business online and off, having possibly big impacts on the bottom line, then we will explore what were the emotional impacts from those actions and the actions or strategies you can take to move your customer relationships forward. Customer Experience Storytime host and storyteller Russel Lolacher shares the story of A Dish Bear-ly Served Cold. In this tale, Robert and Deborah set out on a last minute road trip after their initial plans fall through. Their local adventures don't go as planned and they've all but resigned themselves to a ending their trip with a feeling of disappointment when they come across Baby Bear's Ice Cream Shoppe. Listen to their story to learn how a small business in a small town can have big impacts on their customer's experience, then we will explore what were the emotional impacts from those actions and the actions or strategies you can take to move your customer relationships forward.